Why Sunrise At Nahargarh Fort Is Not A Good Idea? Life is all about experiences. But there are some exceptions too. In a hindsight, you would rather not experience certain things because it turns out to be another way around. If you have followed my blog you would have read a couple of post on sunrises and sunsets in Jaipur. Being a skywatcher and nature lover, I feel every sunset and sunrise is unique. In one of my blog on the most popular sunrise points in Jaipur, I have mentioned that even though Nahargarh Sunrise point is extremely popular, I prefer giving it a miss. Let me share my experience of a sunrise at Nahargarh Fort. It was one of a crisp Sunday morning of February when I started from Kanak Ghati at 5.30 AM. Despite being dark there were a couple of morning walkers on this road which ends at Nahargarh Fort. Vehicular traffic was quite low but I knew in a half hour this road will be buzzing with speeding cars and motorcycles, all heading towards Nahargarh Fort. By the time I reached the sunrise point, it was 5.50 AM. Sharing the sky and the view of the city in this picture. I found young lads sitting here waiting for the sun to come up with loud music playing through the portable speaker. In a couple of minutes, a large crowd congregated here. Howling, shouting, loud music playing from the car is all that I experienced in this time-frame. This picture captures the mood of Nahargarh Fort sunrise point at 6.00 AM. Disappointed, I decided to return back. I’m sure everyone has their own idea of watching & enjoying a sunrise but certainly, this is not mine. For me, sunrise is a spiritual experience. And this alone is a motivation for me to get up so early on weekends. 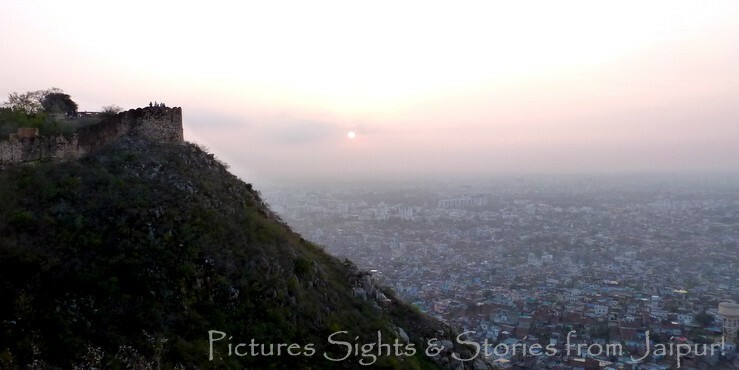 I have been lucky enough to find new and amazing sunrise points in Jaipur which guarantees quietude. I’m sharing a couple of sunrise pictures from various locations in and around Jaipur. In my opinion, Nahargarh Fort is not the best sunrise point in Jaipur; It certainly is the most popular one. A couple of them are a great place for doing yoga because of tranquility and stunning views. On the contrary, Nahargarh Fort guarantees a prolific sunrise experience. Life is about making choices and I’m sure why I’m not heading for Nahargarh Fort sunrise. Have you ever been to Nahargarh Fort as a tourist? Nahargarh Fort is one of the top tourist attractions in Jaipur. If you haven’t seen Nahargarh Fort yet, Here are a few pictures for you. Let me know what you think about this majestic fort of Jaipur. Sun rises or sun sets, they are both a spiritual experience which are so very inviting to meditate. Yet a noisy crowd makes it very difficult. though I take it as a given challenge, to overcome the noise around me and get grounded. Cornelia, since you have visited India, you are well aware of the fact that finding solitude in public areas is so difficult unless you choose really offbeat places. That’s what most westerners notice when they arrive in India. People, noise, and smell… sensory explosion! Wow, what a beautiful experience. Thanks. You write very well and on topics that are different and unique. Something that not everyone does. Keep writing. How should I address you? Hillboy? How did you discover my blog? Happy to know you like my pictures. What’s your name? thank you so much for your appreciation dear… I’m new to blogging and was randomly searching for new people. i found your blog interesting and hence followed you. Thanks, Maniparna 😊. You are right. Each one is unique. The way you beautifying Jaipur with your amazing captures are beyond appreciation. Even I mentioned this earlier too 🙂 . Btw I want to know the secret of high involvement of your readers 😉 ,if you don’t mind. Hi, Priyanka thanks for the compliments. I click with whatever is at disposal out of compact camera, DSLR or smartphone. Medium is irrelevant most of the time. There are no secrets, Priyanka. I think it is about meeting with the right set of people. I’ll be more than happy to share with anything that you want to know. You can connect with me through any messaging app – Twitter, FB or IG. Let me know. Ha ha. There’s no secret, Radhika. But I will be happy to share whatever you want to know. I feel I find it difficult to list my blog under any category. And may be because I write on a variety of topics, it helps. Just a thought, I’m not very sure of this though. What’s your opinion, Radhika? Jokes apart, everything counts I guess – the topic, the images, the interactive style of writing……. I have to agree. Senior bloggers always advice that you should have your own style. It is “you” who makes a blog unique. They say, just be yourself! I’m always there for you Radhika, should you need any advice or help. Thanks, Claire. I clicked these pictures on my smartphone. It was not planned because I never expected so much crowd. I’m happy you liked these pictures. Do you get to see the sunrises? Are you living in London? We are just south of London and do have some lovely areas nearby – Box Hill is one, where the Olympic cycling took place – but we are very lucky to have a beautiful park on our doorstep. When I worked night shifts as a nurse I saw sunrises regularly – it was a very special time of day for many of our hospice patients. These days I tend to be tucked up asleep at sunrise as I struggle getting to sleep! I have never heard about Box Hill. Have you ever written about your city/town on your blog? I can understand how it feels when you are struggling with the sleep. So do you make it up with sunsets, Claire? Do you know what….I haven’t written about where we live – maybe I will do that! Sunsets – yes!!! That will be lovely, Claire! I found this comment in my spam box! Isn’t that “the” irony Arv? Until a place is unvisited it is exclusive, untouched and therefore beautiful. Everyone wants a bit of that – it becomes a tourist spot. Soon the crowds, noise, pollution follow!! And there goes your exclusive beautiful spot. Now that’s an idea for a future blog !!! Should a thing of beauty be a mystery or …..!!!! Wow I discoverd something new and beautiful through your post Arvind. Arv, these are some amazing pictures but it is sad to see such irresponsible behaviour by the tourists spoiling the serenity of the atmosphere in such early hours. Sarmistha, they are mostly young guys, a lot of them are students from other town and here for studies. Nothing much We can do about it. Next Next post: What Makes Jaipur Masala Chowk So Popular?